Developmental Language Process tested at Latseen Camps from Kathy Dye on Vimeo. 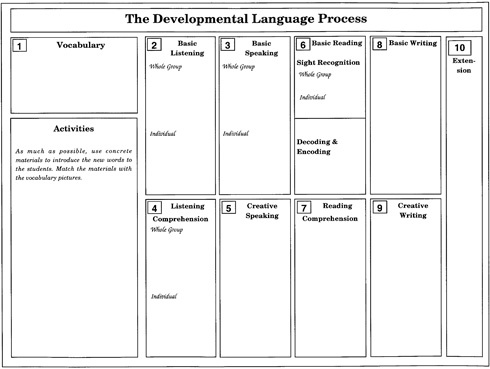 The DLP represents a natural progression of language acquisition, based on themes and content from all subject areas. The sequenced stages of the Process take the students from a concrete introduction of vocabulary, to a symbolic representation of that vocabulary using graphics, to the abstract realms of reading and writing. This provides the students with a bridge from spoken to written language and instills the concept that reading is talk in print. The Developmental Language Process is adaptable to any context in which the goals are language development and retention. This is particularly true in math, a subject filled with complex information and many ab- stract labels. 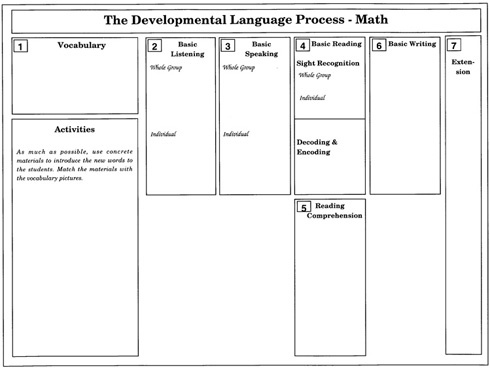 Since a number of the math terms do not lend themselves well to listening comprehension, creative speaking, and creative writing, a fast-track can be created with the DLP, as represented by this schema. 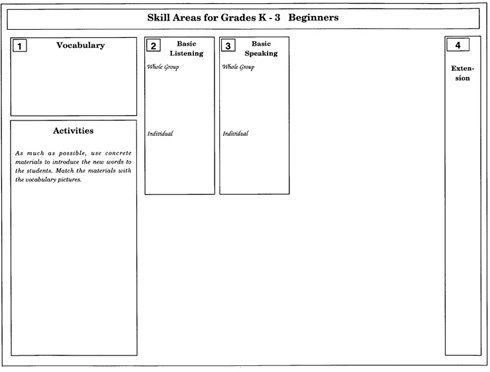 However, a teacher could opt to use all of the DLP stages in the math language activities. This schema is also used in the early stages of the High Frequency Words Programs, thus allowing the students to enrich their language bases in readiness for more complex applications. In kindergarten to grade 3 second language classes, the DLP introduces the students to each key word concretely, followed with basic listening and basic speaking activities. No printed words are used in these stages which gives the young learners a chance to acquire reading skills in one language before tackling the process in a second language; rather, pic- tures and illustrations are used as visual models for the language intro- duced. For many young students, reading can represent a daunting undertaking filled with angst and uncertainty. The DLP establishes a language base before tackling the abstract areas of reading and writing. 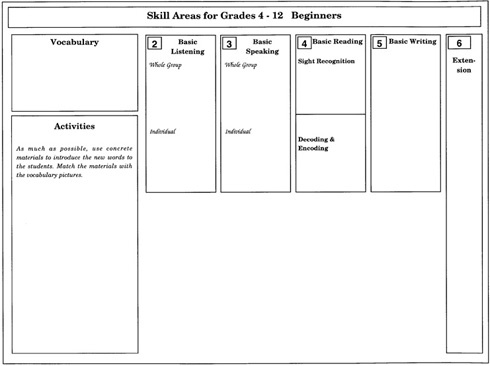 By the time the students reach grade 4, a foundation in reading should have been established in their first language. Second language content introduced and developed through the listening and speaking stages can now be represented in their abstract forms through basic reading and basic writing.